Hi all and welcome back! I am SO thrilled that you all enjoyed my "tree" card. Your sweet comments have made me SMILE! Thank you for your kindness! Today, I have the TUTORIAL ready for you! Make sure to read the message at the end of this post. You'll have a chance to win this card! 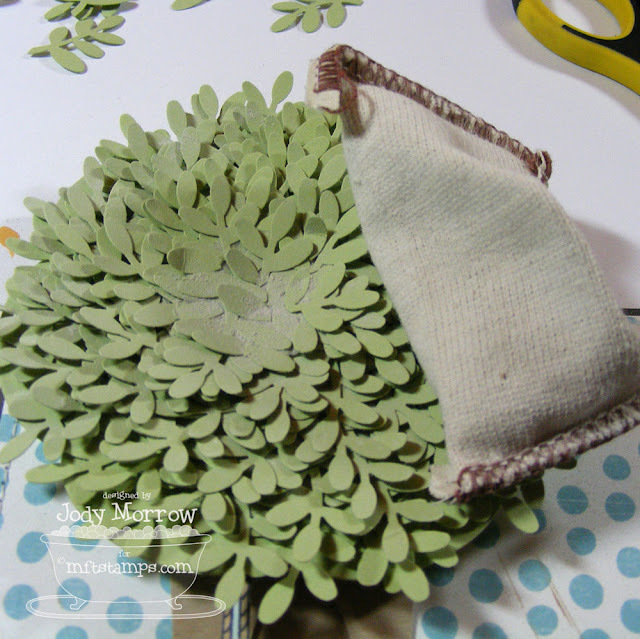 I had to make another one to write this tutorial, so now I have TWO and would love to share with one of my blog readers. 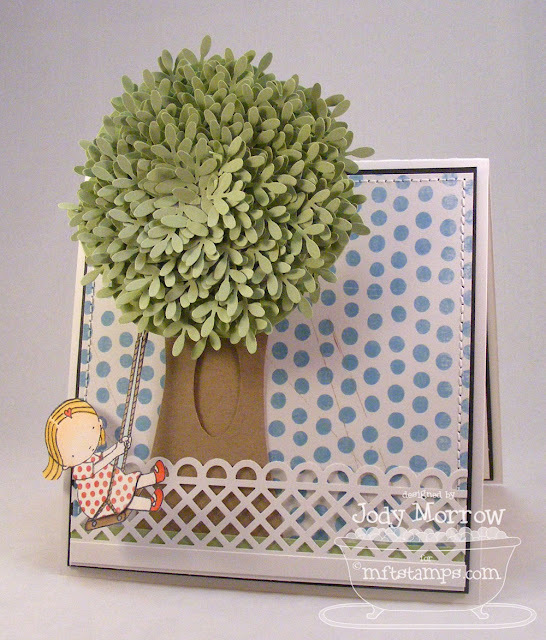 You can view the original post of my tree card right HERE. Just as a reminder, here is the card I'll be showing you how to make. I will take you along each step with full photographs and explanation. The *only* difference between this card and the original, is I ran out of cloud patterned paper (pout), so I needed to use a different pattern from the pack (Love Me Do by My Mind's Eye). My base layer is a 5 1/8 X 5 1/8" piece of patterned paper layered with a piece of black card stock measuring 5 1/4 X 5 1/4". After stitching it together, I made my tree trunk using a piece of kraft card stock 5 1/8" long and about 3 inches wide (to start). I hand-trimmed the tree trunk as shown. 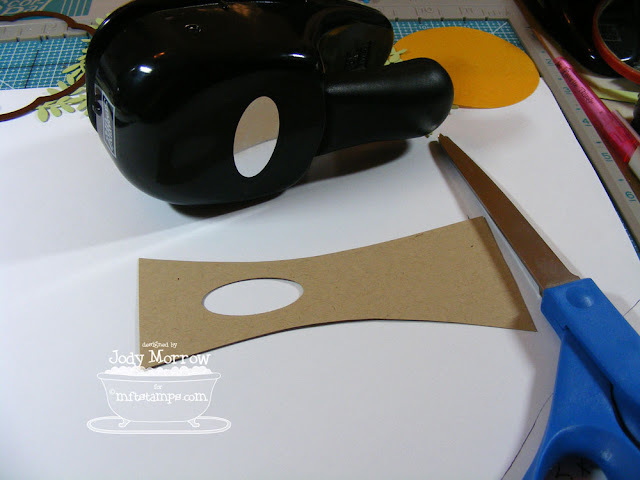 Use a small oval (or circle) punch to punch a shape out of the tree trunk. 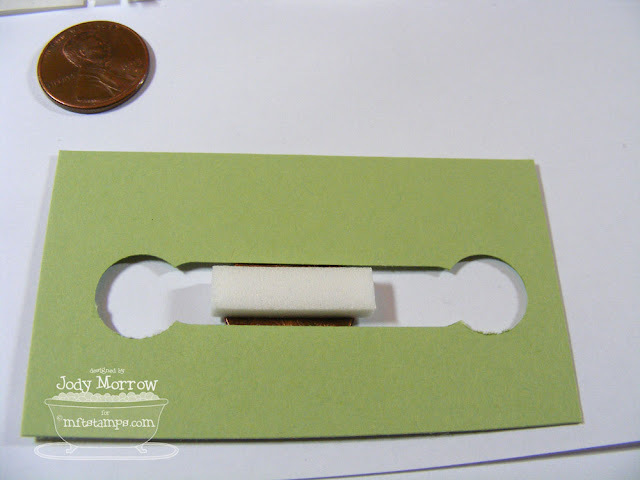 Then, tape a piece of kraft card stock to the back-side, covering the hole, with scotch tape. This will add dimension without being over-powering. 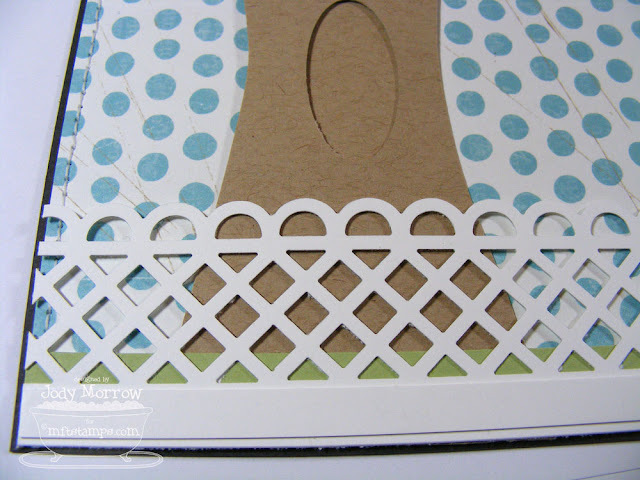 Adhere as shown and then add a strip of green card stock cut to 1/2" X 5 1/8" along the lower edge of the patterned paper over the tree. This is a small detail you might have missed in the original, but I love the hint of grass peeking out behind the white picket fence. Adhere the fence over the green card stock along the lower edge of the card (still allowing the small black border underneath to show). 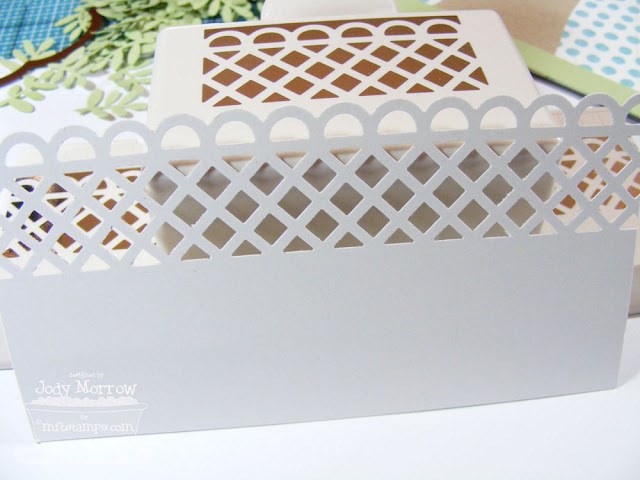 Now add a strip of white card stock cut to 1/4" X 5 1/8" centered on the bottom "rail" of the fence. 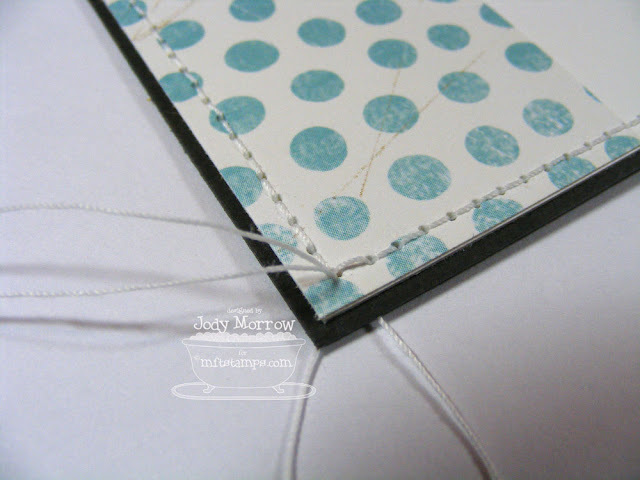 This is another small detail that will add dimension and depth to your card. 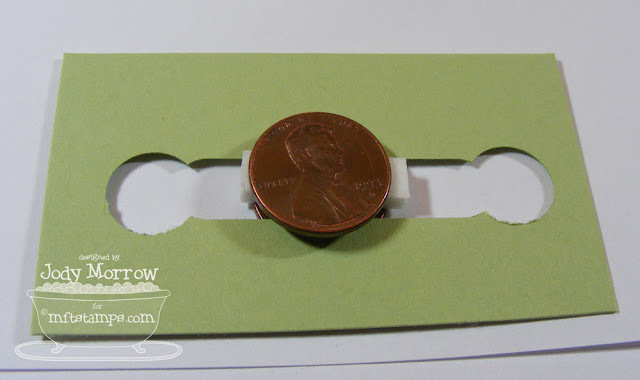 Now you'll need a 1/2" circle punch (another shape that is about 1/2" will be fine) and the word window punch from SU (if you don't have the word window punch, you can create a channel with your paper trimmer). 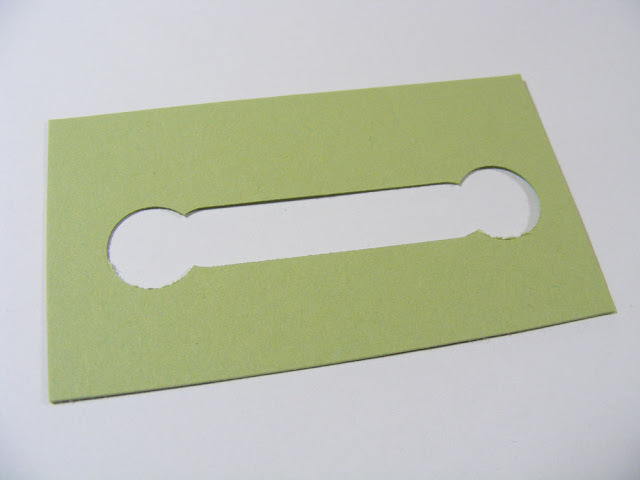 Cut a piece of green card stock to 3 X 1 3/4". 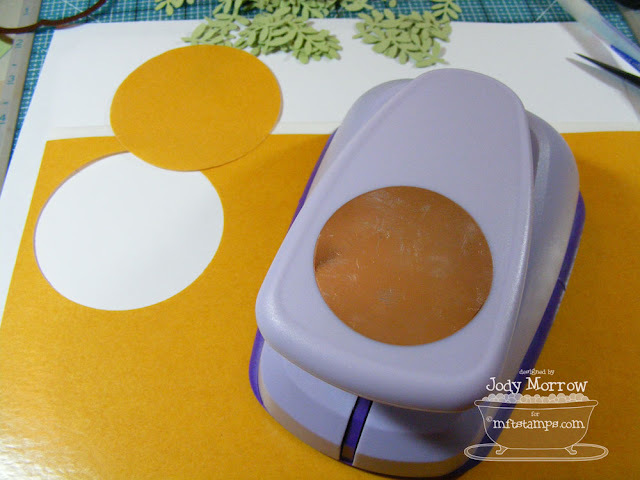 Connect the two holes as shown, using the word window punch from SU (or your paper trimmer). The channel should be approximately 3/8". This is our "channel". Now you'll need 2 pennies, some foam tape (I used strips that I purchased from Hobby Lobby). 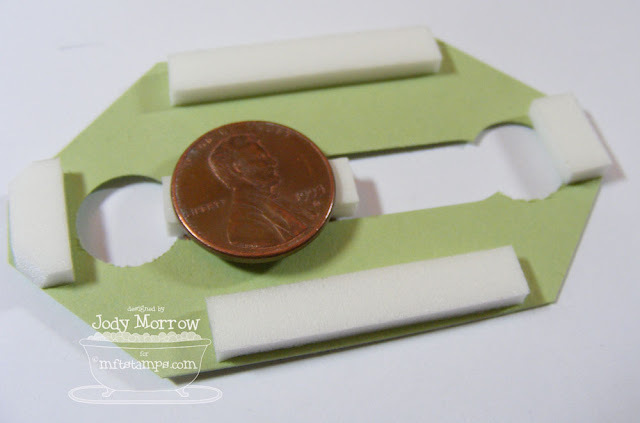 Remove the liner from the foam tape and place the other penny directly over the one under the foam tape. Your penny contraption will now be stuck in the channel, creating your sliding mechanism. Go ahead and tilt it from left to right to see it slide. 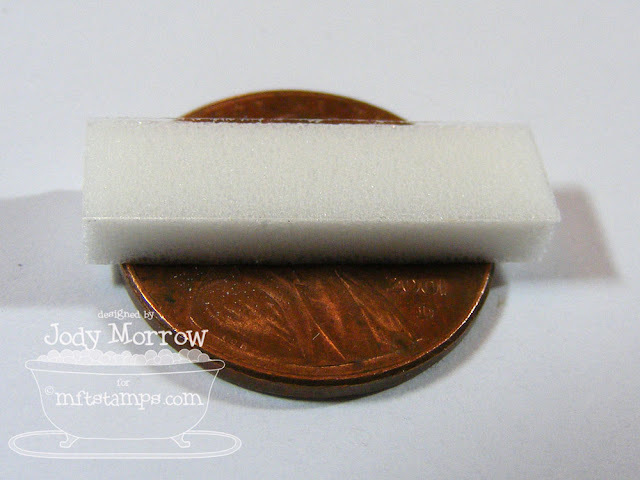 :) If the edges of your foam tape as sticking and are preventing your slider from functioning properly, douse the remaining sticky portion with some powder and blow off (I use a "can of air" for this). The reason there is foam sticking out, is that prevents your mechanism from spinning. 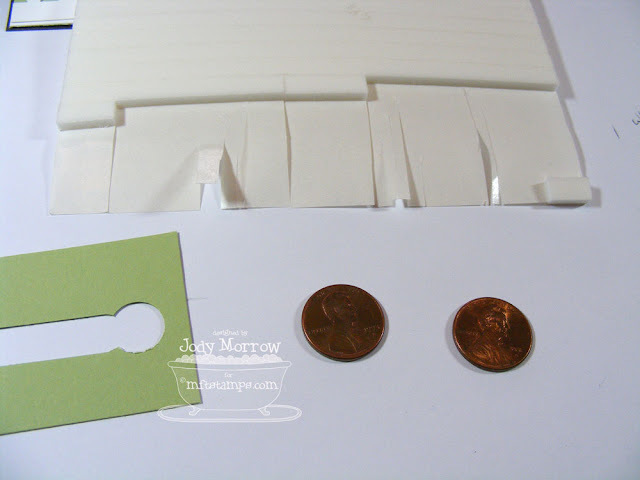 If you were making a spinner card, you would place just a dimensional in the center of the 2 pennies, but the rest of the process is the same. Now, we need to prepare the sliding mechanism to be adhered to the top of our tree trunk. I snipped off the corners of my sliding mechanism to ensure that nothing peeks out beyond the tree top. Then, I placed foam tape on all four sides of the mechanism to lift it off the lower portion of the card (which would prevent it from sliding freely, if you skipped using foam tape on this step). She was colored using Copic markers. Don't feel the need to color neatly inside the lines. You'll be cutting her out, so don't waste your concentration on making it perfect! :) The only part you need to be careful with is between the ropes. That will be colored in a light blue color (or a color that matches your paper underneath). 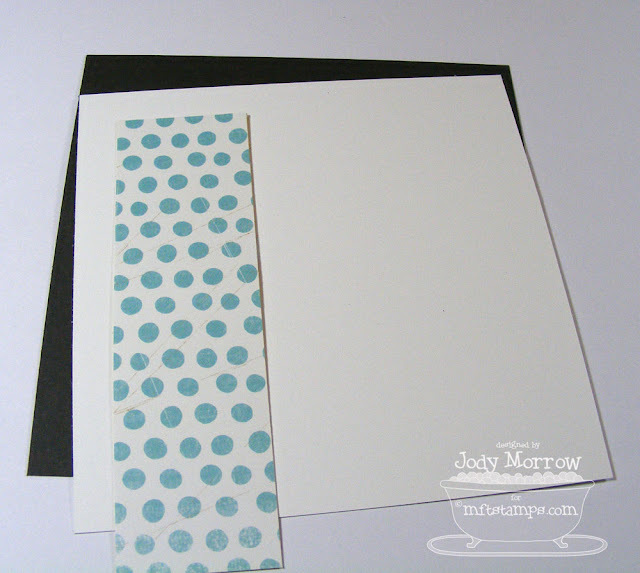 Also, stamp the main image on a piece of patterned paper that coordinates with your color palette. You'll need to make sure her clothing is stamped clearly, which is the only part you'll use. Trim out the colored image completely as shown (be sure not to cut off her hair), and the extra rope. Cut the two ends at an angle as shown. 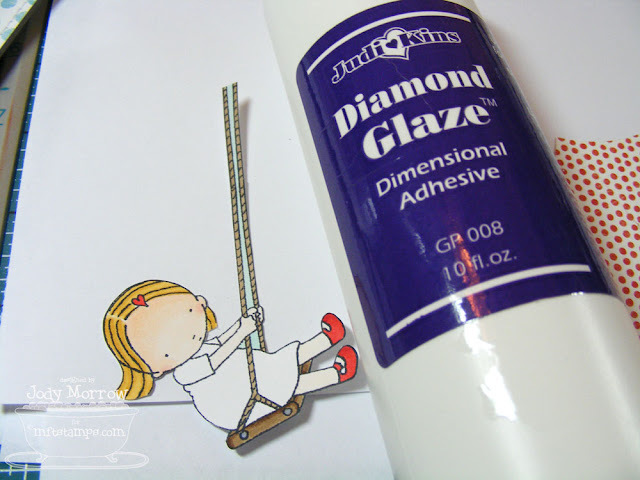 Using Diamond Glaze, glue the ends of rope together as shown. Be sure to just use a dab and clean off any excess glue that shows on the front side of your rope image to prevent unwanted glossiness. Adhere the pieces of patterned paper to the stamped image as shown, using Quickie Glue Pen. Do NOT use an excessive amount of glue, or you will have glue that squishes out the side. 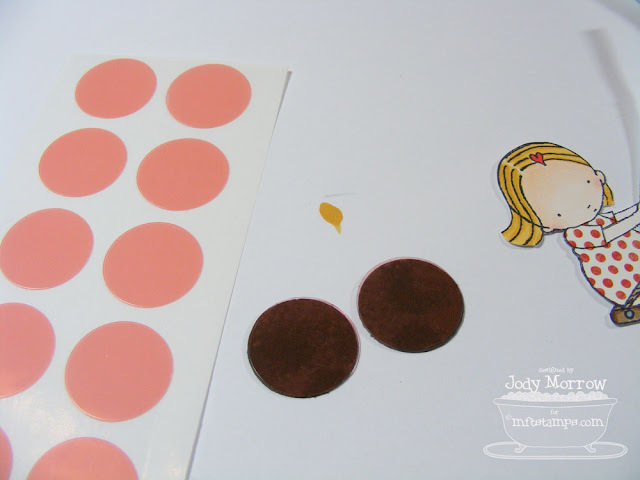 Punch two circles out that are 3/4" (I used black card stock). Cover each of them on one side with a 3/4" red line sticky dot that you can find in my sticky stuff store. Remove the liners from the dots and sandwich the end of the rope between the two black circles. Now adhere the back black circle to the penny using another 3/4" red line sticky dot. I do want to point out that I adhered a 3/4" red line sticky dot to the TOP of my black circle. The liner is very slick and allowed the swing to "slide" freely. Do not remove the liner if you do this. This is optional, and it will work without the additional sticky dot placed on top. 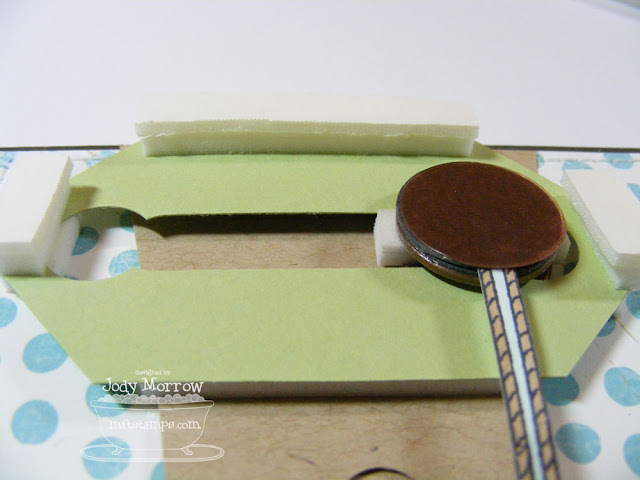 Now, you need to add sticky foam strips to THREE sides on the top side of the slider mechanism as shown. Your slider will move more freely if you use a double layer of foam strips (that is what I opted to do). 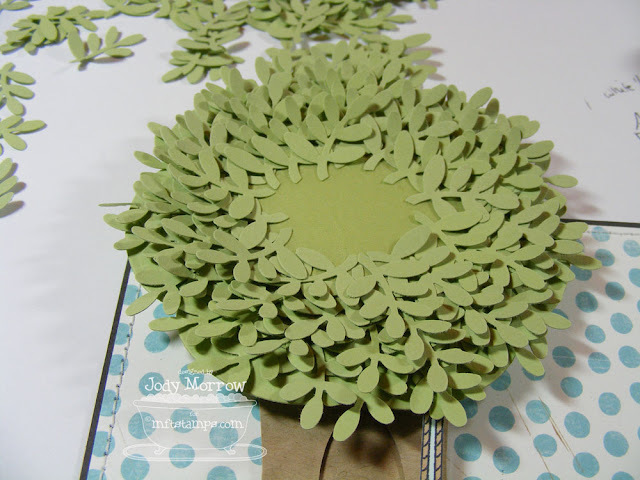 Die cut the largest flower out of the Blossom set of Nestabilities. 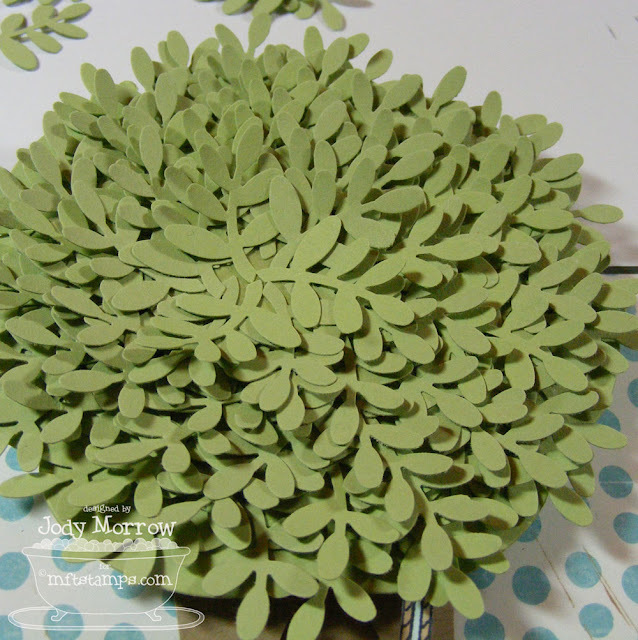 If you don't have these, you could use a round shape or even a scalloped circle. Punch a circle out of Punchable Red Line Adhesive sheet found here in my sticky stuff store using the purple Marvy punch shown. 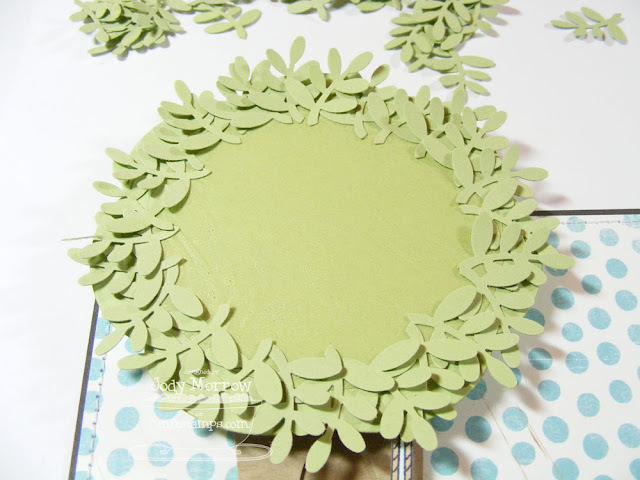 You can also use a circle cutter, or even free-hand cut a circle. 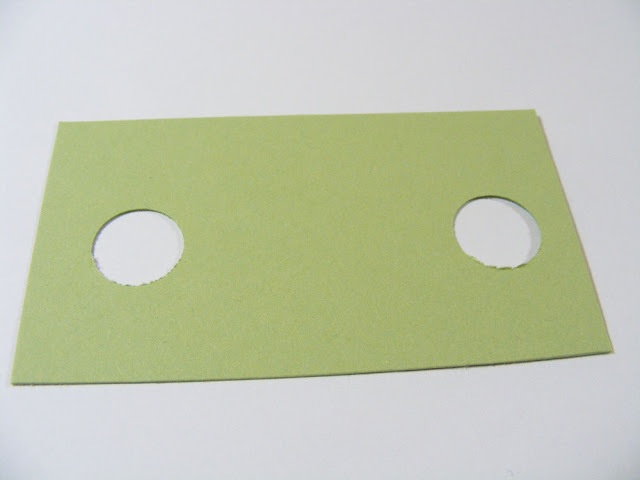 The adhesive sheets will also work with Nestabilities. After you've laid down your 6th layer, your tree top should be almost all covered. At this point, you'll notice a "dip" in the center of the tree. I didn't like the way that looked, so I place a 1" red line sticky dot over the leaf clustered to enable me to fill in the center more. Cut some of the leaf clusters apart as shown to more naturally fill in the last portion of the tree. 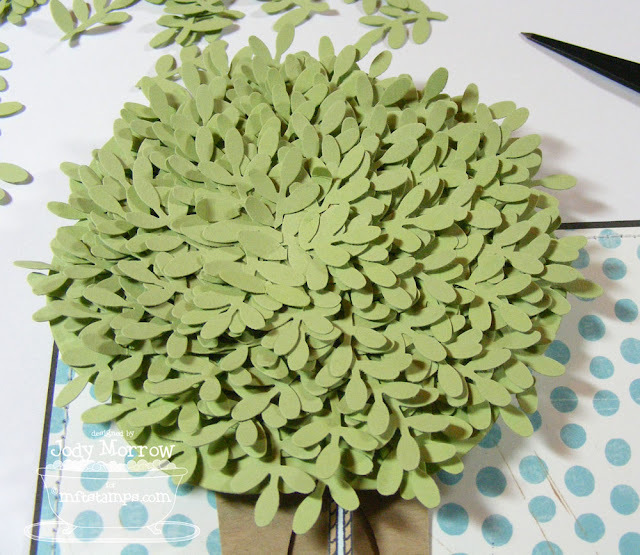 Fill in the rest of the tree and cover as much of the final adhesive dot as possible using the smaller leaf clusters and single leafs. You may need to press them in crevices using your scissors. You may notice some of the adhesive underneath is still visible. 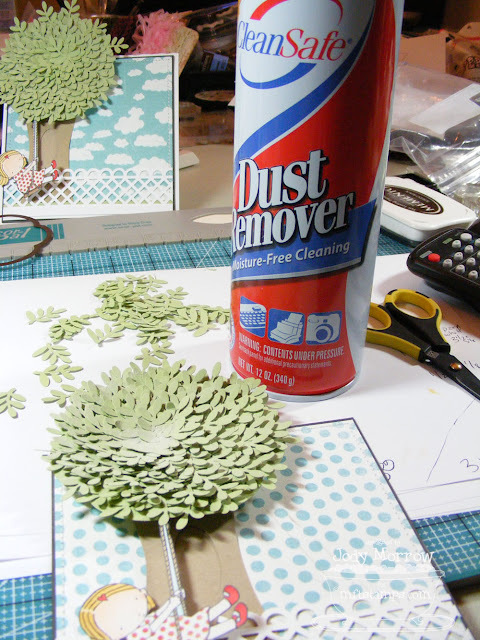 It will likely be only a couple spots if you made your tree full enough, but to make it less visible, I dabbed my treetop with my embossing buddy (you could also use baby powder) and then blew off the excess with a "can of air". This makes all the remaining adhesive matte and less noticeable. Now, let's finish off the inside! 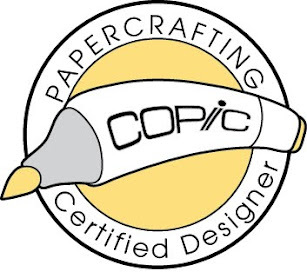 Grab a piece of 5 1/4" X 5 1/4" black card stock, 5 1/8" X 5 1/8" white paper and a strip of 1 1/2" X 5 1/8" patterned paper that matches the front of your card. 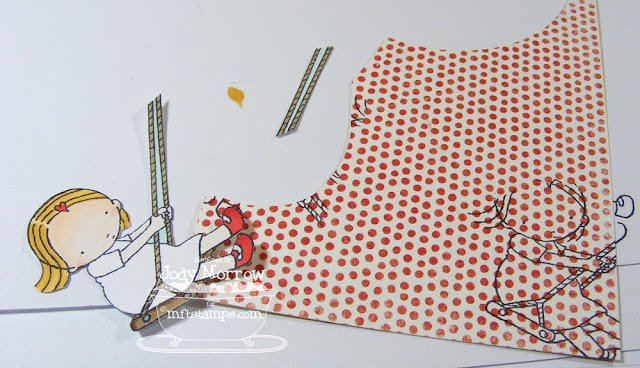 Lightly adhere them together (no adhesive on the edges, only in the center) and stitch together using your sewing machine if desired. Now let me show you a TRICK! Below is the corner that I started/ended my straight stitch around the edge. See the two threads sticking up from the front and the two that are coming out the back? Do NOT trim those off! Let me show you how to NICELY take care of them. 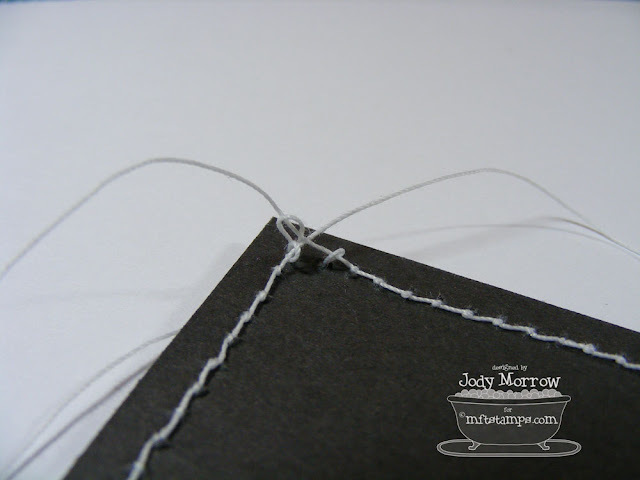 Flip your card stock over and lightly tug on the two threads that are sticking out the back. 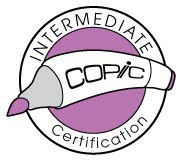 You will see two little loops appear on the back of the card stock. Grab the loop, or stick your paper piercer through it and lightly tug. You will be able to pull the thread through, from the front to the back, and you will now have all 4 threads sticking out the back of the panel. Tug on them lightly, and then tape down the ends with scotch tape (and trim off anything that is protruding out the tape). 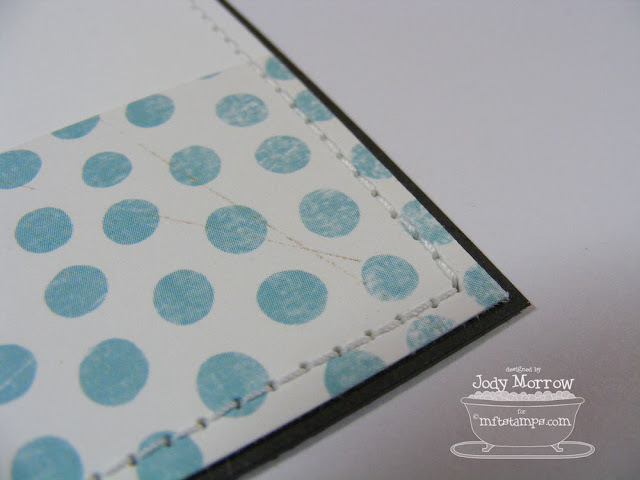 Now flip over your card stock and check out the perfection! :) NO stray threads, no clipped off threads... just smooth stitches with a clean, polished look. Stamp the adorable sentiment that comes in the stamp set, Start the day with "whee" and adhere your inside panel in your card. Whew! All done! I hope you enjoyed the tutorial! Who's ready to make one? You can do it! 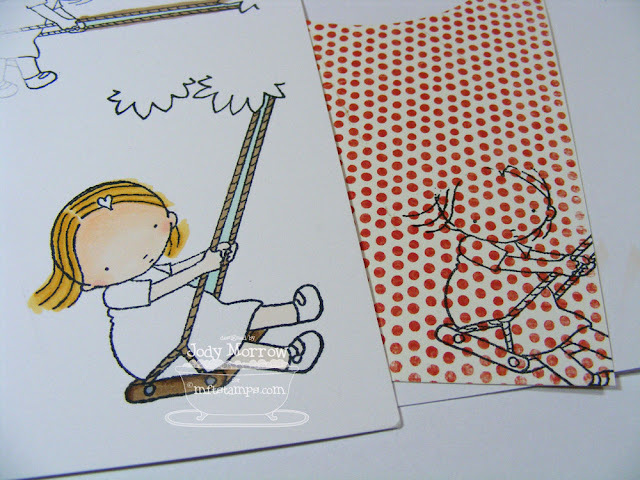 Would you like the chance to win the card made during this tutorial? You all have shared your comments so graciously, that the least I can do to say THANK YOU is offer up this card (and some other goodies) as BLOG CANDY! That is a prize package worth $44 PLUS the hand-made card! So, who wants to win? I'll give you a couple ways to win and you can choose the option that words best for you. Just to be clear, you only have to do ONE of things I list (in addition to posting a comment to this blog post letting me know which one you did). Post a link to this post, directing readers to this tutorial/blog candy give-away, on your blog. 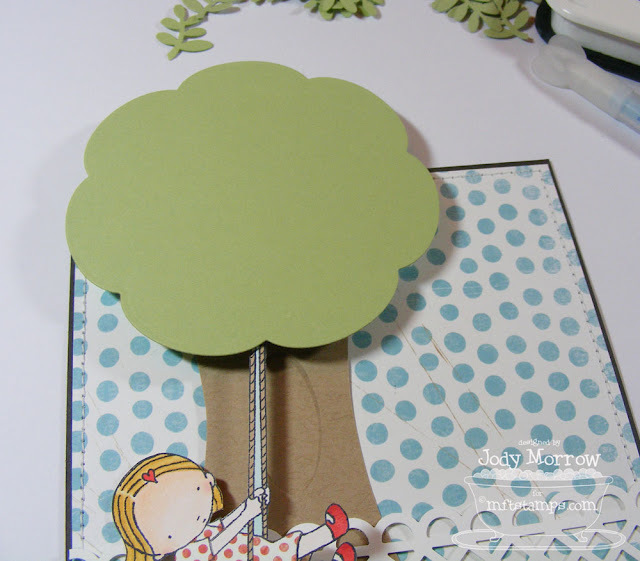 Follow this tutorial and make a tree card (stamps used are up to you), post on your blog or online gallery with a link back to this tutorial. The drawing will take place on Friday, January 15th. I will post the winner no later than January 16th. If the winner does not come forward to claim the prize, I will re-draw on Monday. PLEASE be sure to come back and see if you have won! :) If your comments posts as "anonymous", please leave your name or some sort of identifying verbiage. Again, thank you SO much for your support and if you would like to continue visiting my blog, be sure to "follow" in the side bar, add me to your google reader, or sign up for e-mail notifications of my blog posts in the side bar. P.S. 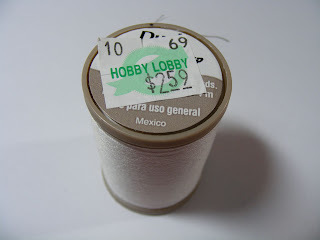 I have had many readers ask what type of thread I use. I took a picture for you. :) It is pretty thick and compared to "normal" thread seems like ROPE when I am sewing, but I SO love the weight of it and I use it pretty much exclusively! This is gorgeous! I enjoyed watching the process and learning! This is just beautiful! Really great tutorial (and card of course!). Thx for sharing! Thank you for a wonderful master class! WOW! This is a great card and you did a fabulous job with the instructions! I have a blog, but with not many followers! I will post this link on my blog for more to see! I would love it if you could take a quick 10 second video showing how the swing moves. It appears that the mechanism isn't like most slider cards and that of course the swing would just "swing" instead of roll, but I'm having a tough time envisioning it! Thanks again! I loved your card so much I decided to use the tree on a layout I was making at that moment. My tree is a little different, since I hadn't seen your tutorial yet. I did link to you of course! What a lot off work has gone into making this tutorial. I certainly will make one,but at the moment I have to finish other projects. Holy SMOKES, what an awesome card (LOOOOVIN' the leafy tree!) and what a DETAILED tutorial! Wowwwwie! I love the card and thanks for the info on how to do. Please enter me to win. You nailed this tutorial. I understood! lol What a gorgeous card! Thank you so much for creating this tutorial! That is the cutest card I have ever seen! Fantastic job Jody! Your photos and directions are clear and full of those little tricks that make it you! Fabulous tutorial, Jody!!! Thanks for all the details! This card is just as out-of-this-world-gorgeous as the first one! AMAZING tutorial! To create this card, not once, but twice...girl, we should be sending you candy! I hope to try to CASE this soon. 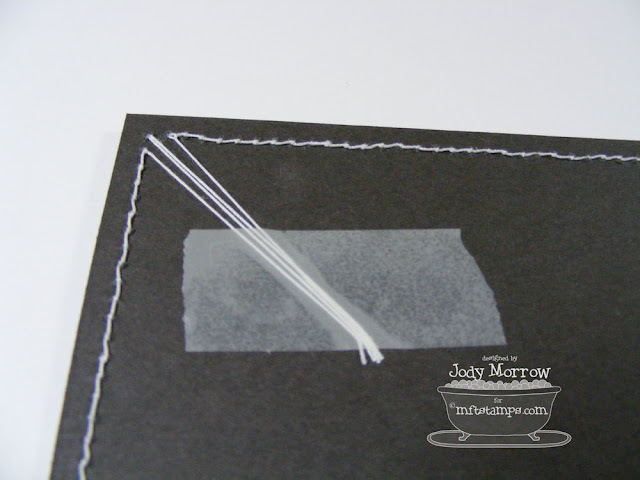 Thanks also for the tip about using the embossing buddy and blown air! I am so going to add that bit of info to my tip sheet. Wow Jody your tutorial is AMAZING!! You are so generous giving this card away, not sure I could after all that work. It is a masterpiece!! What an awesome card and tutorial!!! I love the purr Innocents line of images I have most of them now!! That is awesome of you to give that card away....I would love to be the lucky winner!!!! That tutorial is great. I am going to have to try and make a card like that. You are a very creative person....thanks for sharing it all with us!!! The most FABULOUS card I have ever seen! And sharing how to make it? Thank you just doesn't seem enough! WOW!!! I've learned more "tricks" than just how to make the tree! Thank you, thank you, thank you! I totally love the tree you created! I can't wait to try it out myself. Thank you so much for sharing this tutorial!! It's amazing and very clear!! thanks for the chnace to win the card and goodies too! The slide is nice, but the tree wow fantastic, the directions are great and easy to follow as well. Thanks. Thank you so much for creating this tutorial. When I saw your card earlier this week I was blown away. It is so cute, awesome, boy, I could just go on with the adjectives. 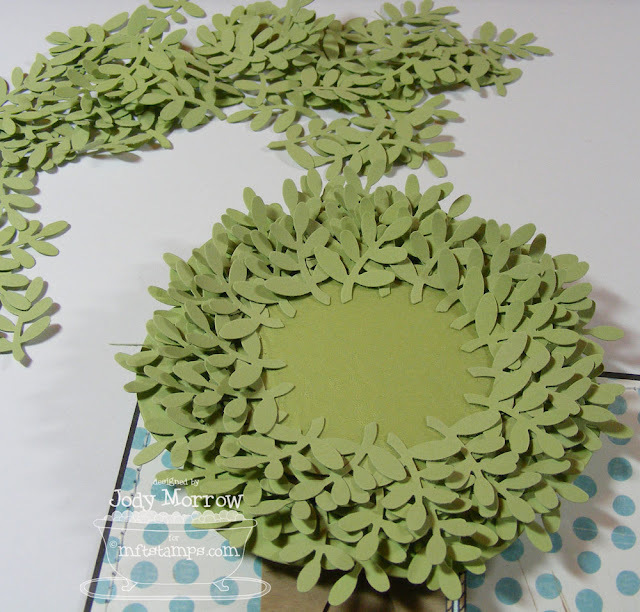 I posted a link to this tutorial on my blog. Wow--I just loved this card the first time you posted. Thanks for the tutorial. I have put this on my to-d0 list sometime when I really have a full afternoon to craft. I like to start and finish a project in one setting. Your photos will really help out. Thanks for the generous blog offer. I am in love with this stamp set--love the name too, it really captures the look on the little child. I am a very happy subscriber to your blog. Jody: Your tutorial is fabulous, so nice & detailed. Very clear! Of course your card is amazing, and I'm always in awe of your sewing abilities, I've learned so much from following your blog! And how many hours did it take to create this card? hehe I LOVE your tutorial - it is very easy to understand and to do. I hope to try one soon. Love that little girl and the saying!! How adorable. The tutorial is fantastic. Makes me believe even I could make one! 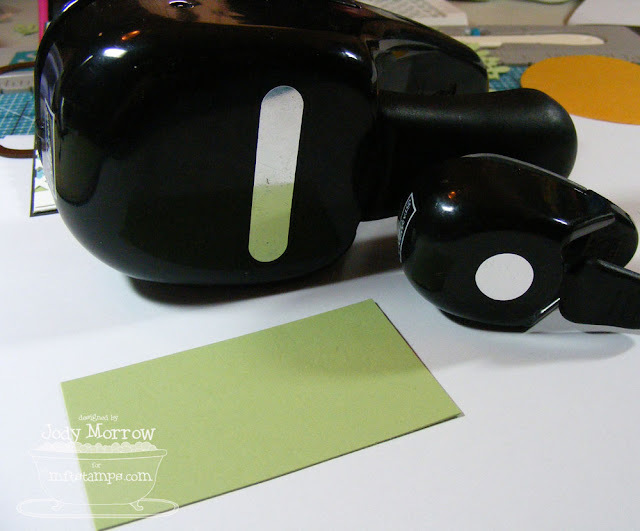 Gosh, I am so excited to return to all my stamping supplies (I am in frigid FL right now) so that I can try out this awesome tutorial. I have seen some for a project like this, but never as detailed. Thank you for all the time it took to do this for us. Wow! Love that card! The detail in your tutorial is fantastic. Since I don't have a blog or online gallery I'm just going to be posting here. Posting a comment for the contest.....Your card is fantastic!!! That tree is something else and I admire you for all the work you put into that tutorial. Amazing job! This is an AWESOME Tut Jody and all the time and energy you put into it and THEN to give away the card, SOME LUCKY SOMEBODY (me me me) will be SUPER HAPPY!!!!! 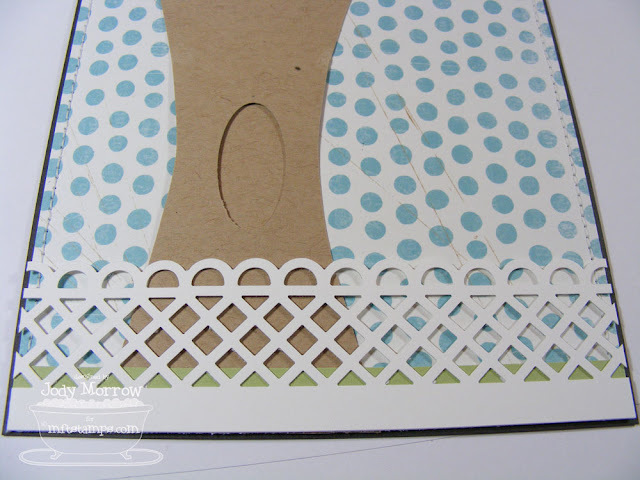 OMG-not only am I WAY appreciative of the work that went into this tutorial but I would LOVE to win this amazing card! WOW this is absolutely WONDERFUL Jody!!! Whew, I need to win this card - it's a beautiful card, Jody, but I don't think I can make it! Thanks for sharing ... maybe someday, but I did buy the stamp so maybe. This is an amazing, amazing card...speaks quite loudly to your creative perseverance! I don't have a blog anymore due to time constraints, but I'd love to win the candy! Question: do you think the mini-Janome can handle the thicker thread you use? Oh my Word! this card is just amazing.... How sore was your wrist after all that punching? Well it was worth the effort because it is a stunning card! The blog candy is great, but I would be happy with just the card. it is a true work of art! Wow! 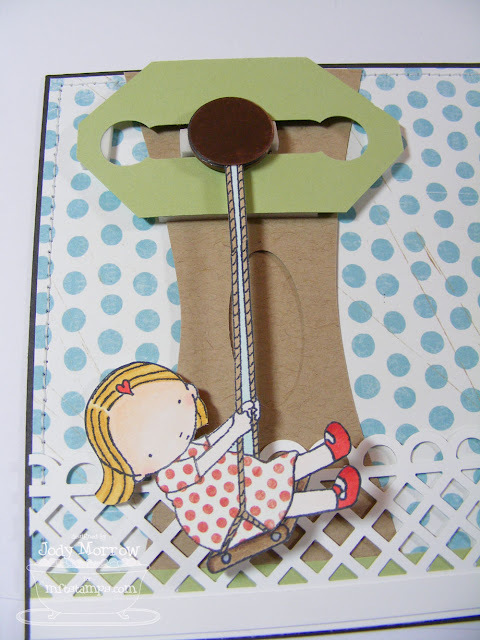 This card is amazing & the tutorial is fabulous. I would love to try to make a card like this... thank you for the tutorial and the inspiration! ohh, it's really beautiful card!! and thank you for the master-class~! Jody, I love this tutorial. 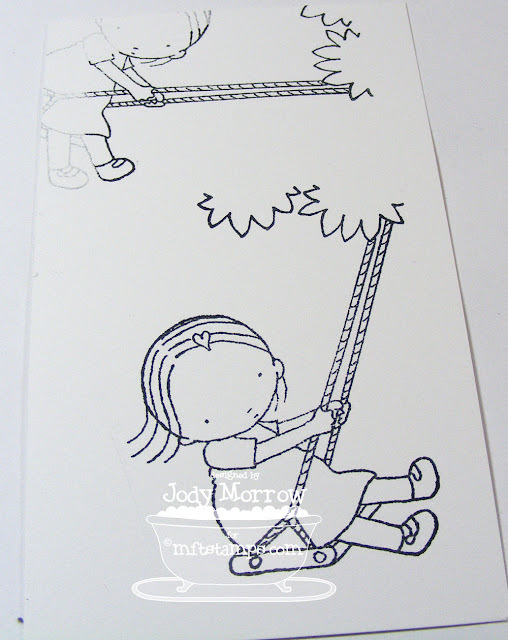 This is the sweetest tree swing card I have ever seen. 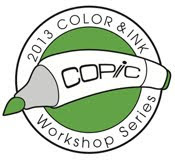 I love the depth, texture, movement, coloring, paper piecing, punching, stamping, everything. If I had this stamp, I would make one. Please enter me in the drawing. Thanks. God bless! That tree is unbelievable! Thank you so much for posting the instructions, which were wonderful and clear. I am inspired to try something like this! Also, thanks for letting me know about the thread - I got a sewing machine for Christmas and love the look you got with the thicker thread. Thanks for the chance to win! This is the most amazing card that I have ever seen! Seriously! Thanks for the giveaway, hope I win!!!! Wow!! This is an amazing work of art! Wow!! you are so talented!! Awesome! Wow, what an absolutely fantastic card and super instructions. Thanks so much. I feel that it would take me weeks to finish a card but would love to win it. Thanks for the give-away. I loved the card when you first posted it. And now this fabulously detailed tutorial--wow! Thanks so much. I'll be sure to save this to make a special card for my grandaughter. She's only one now, so I'll save it until she can more fully appreciate it. OMG! This is a piece of art --- how can you ever part with a card like this when so much TLC and effort went into make it?! TFS your talents --- UNBELIEVABLE card!!! Jody!!! This is so awesome!! Thanks for the step by step tutorial. I think even I can do this. Now to get that silly sewing machine set up!! I love this but I am so tired. I will let you make them. Back to my cave until april. BTW I twittered this. Joanne, you are welcome to right-click and save a picture of my card to post on your blog. Thanks! What a great tutorial and card. Can't wait to get my stamps, including this one. 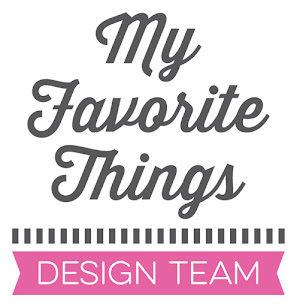 I always enjoy your projects and am adding you to my google reader, thank you for always having such fun cards posted!!! I don't have a blog or online gallery, but I just have to tell you that this card is absolutely amazing!!! I love following your blog. You are so talented!!! Thanks for the great inspiration! I do intend to try making this card!! Once again, you make this look soooo easy!!! Which I know it it NOT!! :) Look at all those branches/leaves you punched. But it is a FABULOUS tutorial!! You are AWESOME!!! Oh my, I am blow away by this creation! I am amazed by your creativity! This is outstanding! Wow! I really love this. 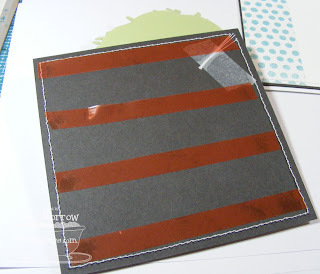 I plan to make this card because I am intrigued by it and want to see if I can make it work they way I think it works. I don't have a blog and came to your blog by my friends recommendatios. I have forwarded your blog address on to several others. Love your cards and glad to have a sticky tape source. HEHE, I was just about to ask which thread you used so thanks for adding that!! The tutorial is amazing, I can't wait to try and make one. And thanks so much for offering the chance to win one, I posted it on my blog so that everyone can see it!! i have been wanting to make a slider card, but just haven't yet. yours is adorable! that is a perfect stamp to use as a slider card. way cute! thanks also for the sewing tip. need all the "tricks" i can use. Awesome tutorial! Thanks so much for sharing it with us. Will definitely give it a try! Totally in awe Jody!! Not only is the tree amazing, but your functioning swing is super fabulous!! WOW! That is such a beautiful card - the tree alone is georgeous! I haven't made slider cards in awhile, you've inspired me to break out the pennies again! Thank you so much for sharing the tutorial for this! Your card is phenomenal!! Oh, and of course thanks for the chance to win! I would love to have it on display in my scrappy space!! I have posted your candy and tutorial on my blog! WOW, I thought the card was amazing! And now an amazing tutorial! You are ONE talented lady! Thanks for inspiration! great tutorial jody! i might have to get brave one day and try it!! love it to pieces!!! it reminds me of one of my dad's favorite photos of me when i was about 5...thanks for the happy memory!! Great card, just doesn't seem like a big enough compliment. This is really amazing. 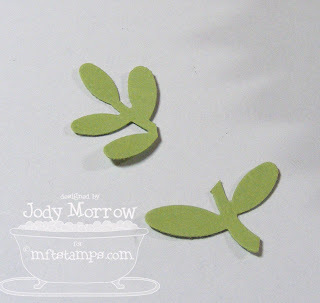 I don't have the same little vine/leaf punch but I have something similar that I am going to try doing this with. Thank you for all of the detailed instructions and making it look easy. So glad I stumbled across your blog. Bookmarking this one for sure. Awesome card Jody!!! And fantastic tutorial! 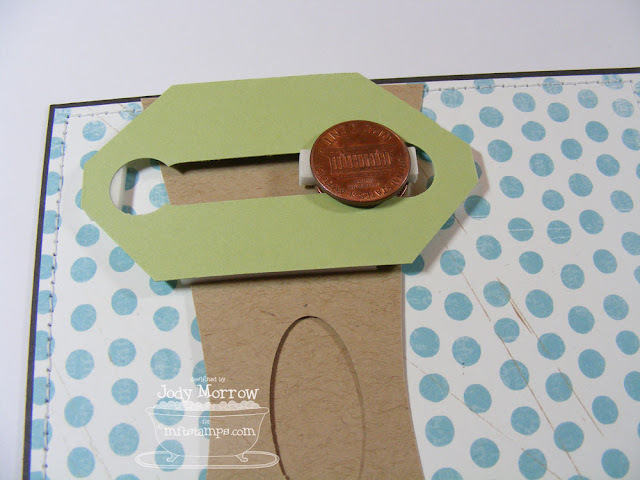 Link on my bookmark- I have to try one soon! Really beautiful! HOLY COW...this is amazing! I am definitely going to try this, and your tutorial was so unbelievably clear! 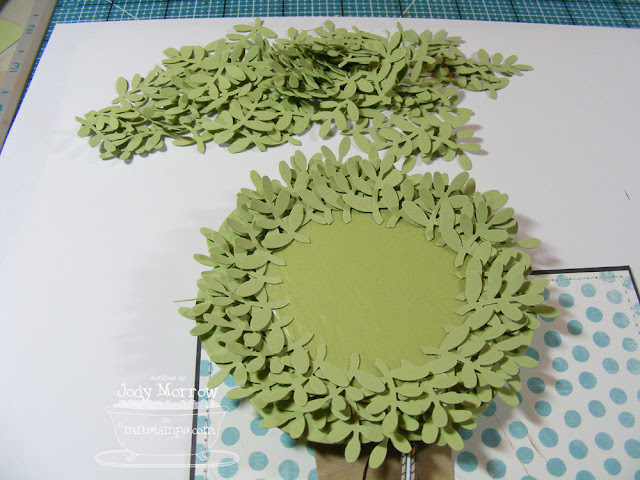 I'm so glad Jamie posted a link to your tutorial and store...I'll be shopping there this afternoon! Thank you! What an adorable card! Love all of the detail and creativity. Thanks for sharing this tutorial. Now we can use your ideas to create our own. 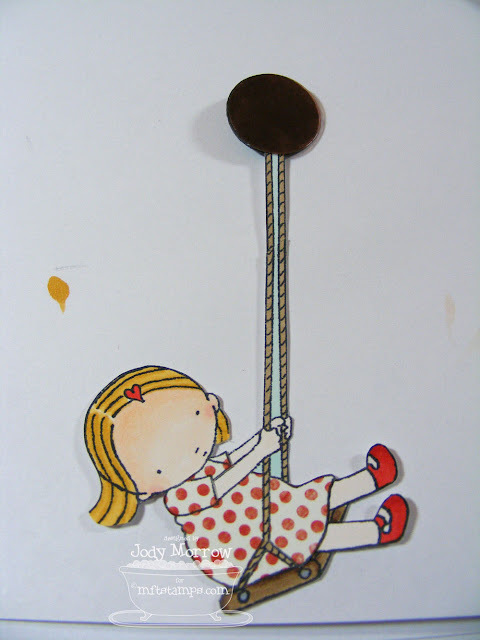 Would love to win this card to send to my grandaughter! Thanks again. This card is AMAZING! The details are incredible and the tutorial is so concise! I will work up the guts to do this card! You're awesome for sharing all of this with us! Wow Jody!! Amazing toot! Love it. 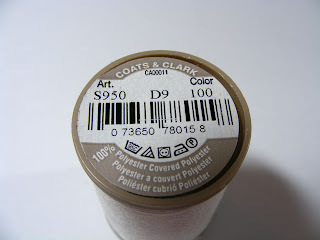 So many useful tips: thread ends, powder, patterned paper. Thank-you! 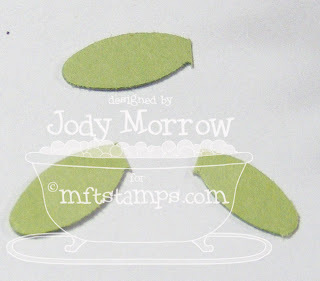 Hey Jody...I linked up your tutorial today. You did a FABULOUS job on it, thanks for sharing your fabulous talent with us!! Great tutorial! What a cool idea, making it slide instead of spin! I do hope to try this soon!!! Thanks for taking the time to do this!!! This is awesome I love it, would be honored to win it also! Wow, that is an amazing card, with an amazing amount of work to do!! If you were in my area I would ask...beg you to do a class so we could all re-create the card! A truly beautiful card! It is so nice of you to share a tutorial. I know that I would never be able to do all that punching. I would love to win such a lovely card. Thanks for this chance to win some goodies :)! I love this card and thank you for the tutorial. 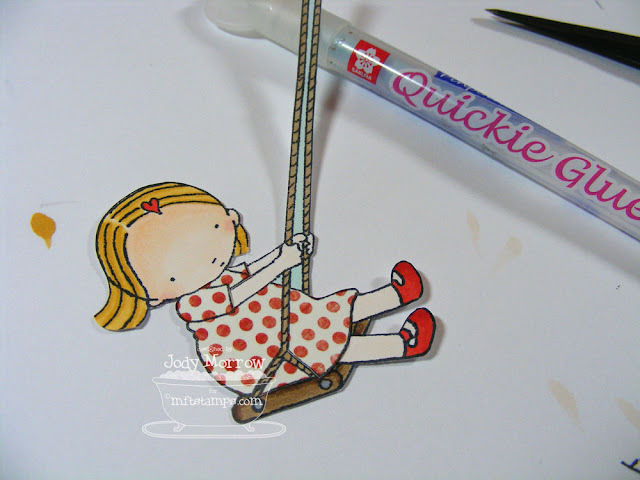 I have posted about your tutorial and giveaway on my blog. I have a HUGE blog candy on my blog too if I want to check it out. About 50 items now! 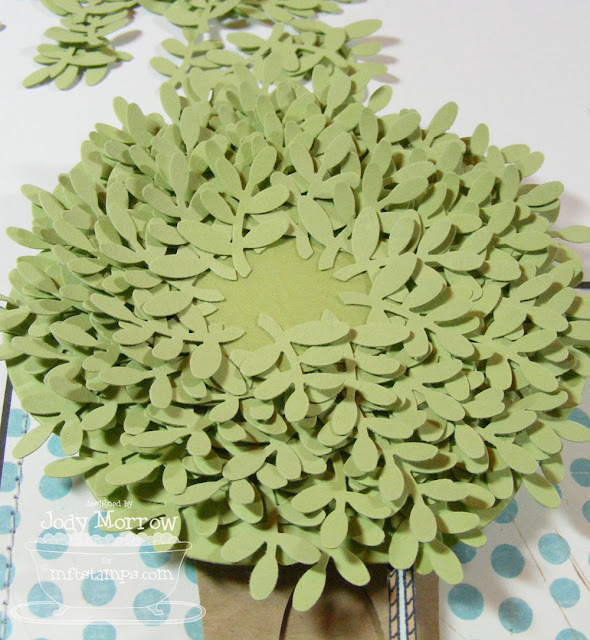 I couldn't imaging having to cut all those leaves by hand, thank goodness for those die cutter things. Absolutely adorable! Thanks so much for sharing! Seriously, this is amazing. The tree alone! Then add the girl swinging. WOW! FAB job! This is an amazing card,, and the tutorial is so detailed and well-photographed, I will definitely be giving this a try. I love kinetic cards and other art, so it's just my kind of project. This is spectacular. Thanks for sharing, I would have tried to make it - if I had the patience to make that tree alone. Awesome! This is just too cute. I am thinking of turning it into a Valentine card for my hubbie!! Thanks for the great detail in your tutorial. This is an absolutely stunning card! This is my first visit to your blog and won't be my last. I am so impressed and wish I was on your Christmas card list. Jody - the card is so fantastic. A friend emailed me your post and I am definitely adding you to my google reader. I just LOVE your blog. Thanks for the inspiration and the chance to win. (sorry, I don't have a blog so I won't be posting - but I will be forwarding on to a couple of stamper friends of mine). This card is amazing and frankly so are you!!! I try to think outside of the box but I don't think I could ever come up with something so fabulous. However, thanks to your tutorial I can at least try. Wow what a fantastic card and tutorial, loved it. I love this card! It's amazing but I was thinking about something like this last night. I was making tiny tatted butterflies, flowers and birds and thought how great they'd look displayed on a card or journal page set up similar to what you've made. I was planning on designing something for it today and now I have your fantastic card and directions to help. So cute! Wherever do you come up with such ideas? all I can say is amazing! Great creativity! 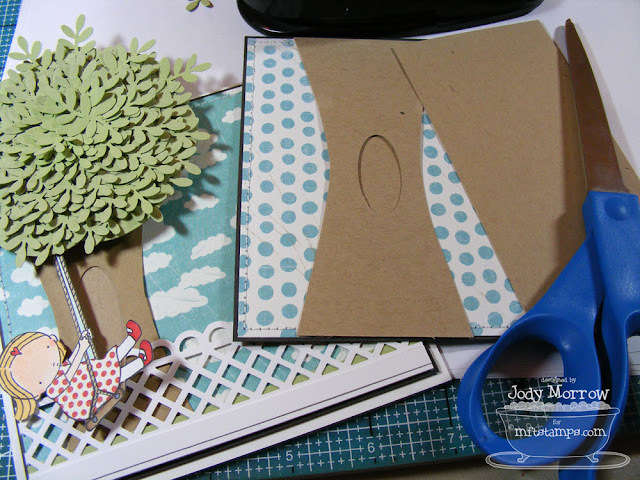 wow, this is the most fantastic tree i have seen, i can see this on both cards and scrap pages, i only just discovered your blog by accident, but it is now in my favourits. Thanks for your tutorial! I just started making cards using my cricut and will have to try it! Unless I win your giveaway! It is stunning and sooo fun! I cannot wait to try it! I have always wanted to try one of these type cards but was so intimidated but you made it look so awesome! now to find the supplies!! My grand daughter's birthday is at the end of the month. What little girl wouldn't love to get this card? Thank you so much for showing us how to make it!!!! I wish I had seen this in time. This card is amazing and I would love to make it. I don't have the punch or stamps but will try to figure out a way to create a similar work of art. Thanks for the great instruction and inspiration. This is the most gloriously beautiful thing I've ever seen in my life! I need a leaf punch! Someone get me a leaf punch! Its beautiful - thanks so much for sharing! Great great idea! That tree is amazing! So very cool! Love this card. Thank you for the tutorial! This tutorial was wonderful. I know there is a ton of work in the card but you made it look like even I could (maybe) do it. Thanks for sharing. This is so great! I posted a link to you on my blog with my version of it. Wow! What an awesome card. Thanks for such a detailed tutorial!!! Amazing! 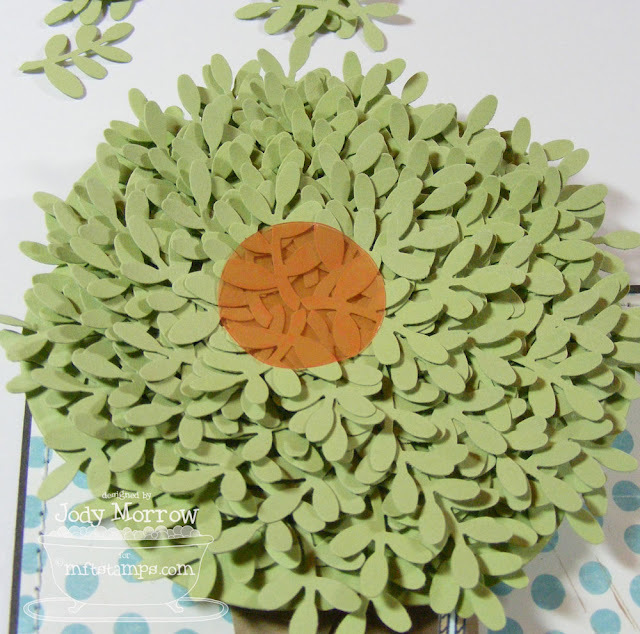 I just found your blog today and I am blown away by your talent for making paper crafts. 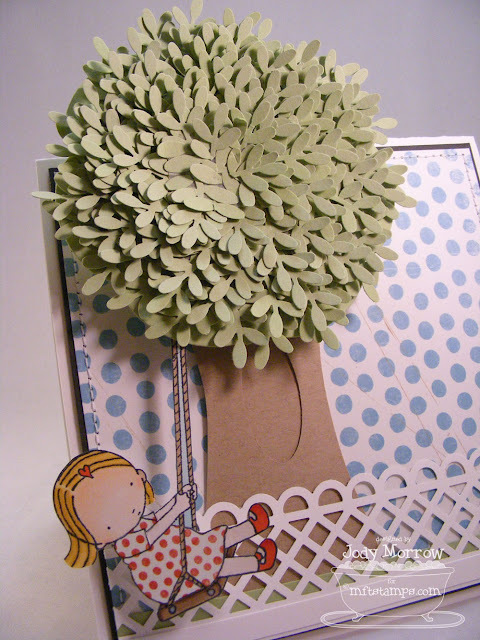 This is the best tree and swing I have seen in paper craft. I don't have the equipment to make it but i sure do like it enough to try making it without it. Thank you so much for posting this. It will be great for my son-in-laws for Fathers Day. Wow... I just found this tutorial and this is the coolest thing ever! I am totally going to make this! I wonder who won this amazing card!! What a lucky duck! Picking my jaw up off the floor right now. I LOVE making my own trees for projects. This one is simply amazing. 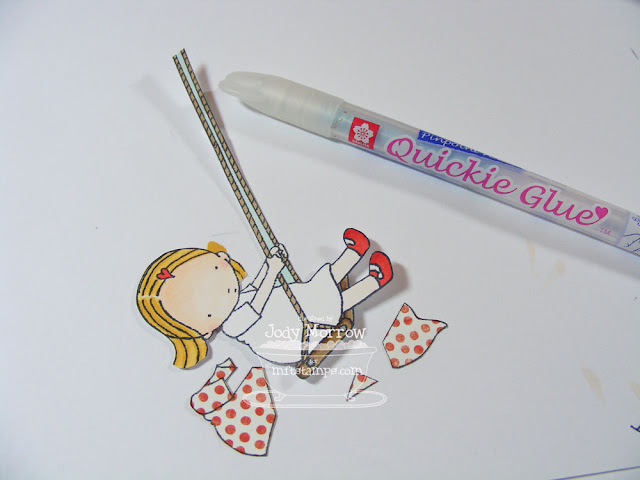 And then to add the swinging girl? Perfection! This card really 'wheel' !! Lovely card. I enjoyed watching the process and learning! I´ll post on my blog a link back here to you win the credit. OOO-Wheeee! Great!Amazing! Thanks for idea & link. I'll try to use some ideas making a clock. That would have to be the most comprehensive and well photographed tutorials I've ever seen. Thank you for sharing your ideas with us. I hope to have a go . . . one day.